Locality and the Impact of Human Consumption on the Environment is navigating us to the field of everyday consumables and gives an insight on how society has major impacts on both the physical and human spheres. 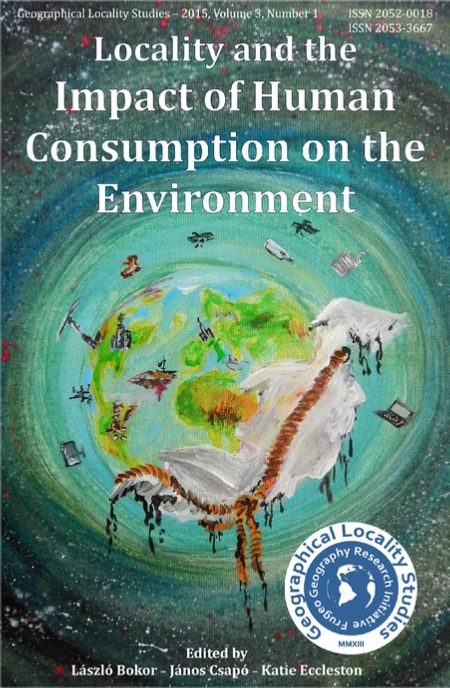 In this third number, Geographical Locality Studies analyses consumerist necessities and needs, and addresses solutions in maintaining human awareness on major environmental problems. This number has therefore been prepared by an international team and has resulted in 7 lengthy papers which are all based on original ideas and research. The authors are all from diverse areas of subject specialisms; from fine art to environmentalism and architecture to geology, all contributions come with professional researched data as well as personal interest in the topics themselves. In this present journal, a number of cases according to their environmental effects on nature, society and economy are discussed including a wider analytical view over the industrial impact of certain countries (for example BRICS), the importance of cohousing and the design of living spaces, production of items (for example textiles) and commodities (for example coffee), and tourism. Our aim therefore was to reflect on consumerist habits and how these effect the environment. There are a high number of recommendations on how these issues could be addressed effectively to reduce the human' impact on them and work towards a less stressed environment and planet. This issue is dedicated to Gábor Karátson, an artist, writer and philosopher who was a highly versatile man and has left a major impact on the Hungarian environmentalism who also highly inspired the production and the design of this publication. This article investigates the environmental impact of urban cohousing communities. Pro-environmental characteristics that reduce the negative environmental impact of cohousing communities are also examined. The article also explores the factors and processes these pro-environmental characteristics are created by. Many of these are derived from examples of working cohousing communities in Denmark and Austria. This paper analyses whether the economic growth has a direct effect on the environment. It is particularly focusing on the BRICS countries and gives an overview on sustainable development and consumption, attempts to suggest a literature review on the correlations between the economy and the environment in the these countries, and addresses the environmental effects of economic development on the basis of different statistics. The authors in this article combine their different research backgrounds in geography and fine art to discuss and analyse the damage caused by the textile industry to the living environment. The first part of the paper gives an insight to the geography of textile production in selected Asian countries. The authors then go into specifics on how a textile production can have multiple processes, all in which include their own damaging effects to the environment. This paper is a thorough analysis and critical evaluation in regards to popular commodities and their effects to the physical, social and economic environments. It employs the Need Model and other geographic methods to focus especially on the coffee industry. This paper shows facts, shares ideas, increases responsibility and sensibility, and teaches methods to initiate further individual actions in understanding the importance of locality and sustainability. 5. János Csapó:Responsible Tourism Destinations: A Win-Win Situation for Sustainable Tourism Development? The article intends to present the most important steps and forms of the creation of responsible tourism destinations and its importance in modern tourism development. Such issues will be dealt with as raising awareness of responsible tourism and sustainable tourism destination development, responsible destination branding or the behaviour of the new tourists with a strong focus on the impacts on the physical environment. The aim of this study is to give an overview on the relation of health tourism and the sensible natural environment of the famous Hungarian spa resort, Hévíz. Through examples, the authors show the risks threatening Hungary’s famous spa towns and what actions and measures should be carried out to preserve and maintain these valuable natural resources. The possible ways to release the increasing environmental pressure of tourism is also presented. This paper demonstrates the role early building performance and cost evaluation could play in delivering affordable and energy efficient homes through evaluation of housing typologies against the UK policy set benchmark for assessing new built and zero carbon housing. Extensive reviews of various methods and techniques have been followed for pre-design evaluation, building performance simulation and cost estimation.